This recipe is definitely versatile. I actually started out wanting to make the delicious classic Leeks Vinaigrette, but I made a few changes. I added asparagus to amp up the veggies, but it can definitely be left out if you prefer. I also added eggs that weren’t quite hard boiled, because, well, I love eggs, and will put them on almost anything! The vinaigrette however, should not be missed. It really makes the dish. First, place a pot of water over high heat to boil the eggs. Once boiling, carefully add the eggs and boil for 7 minutes. Remove from water and immediately plunge into ice water. Peel right away and set aside. Place the asparagus in the bottom of a small roasting pan. Preheat the oven to 425°F. Meanwhile, heat 2 tablespoons of butter and 1 tablespoon of olive oil in a pan over medium-high heat. 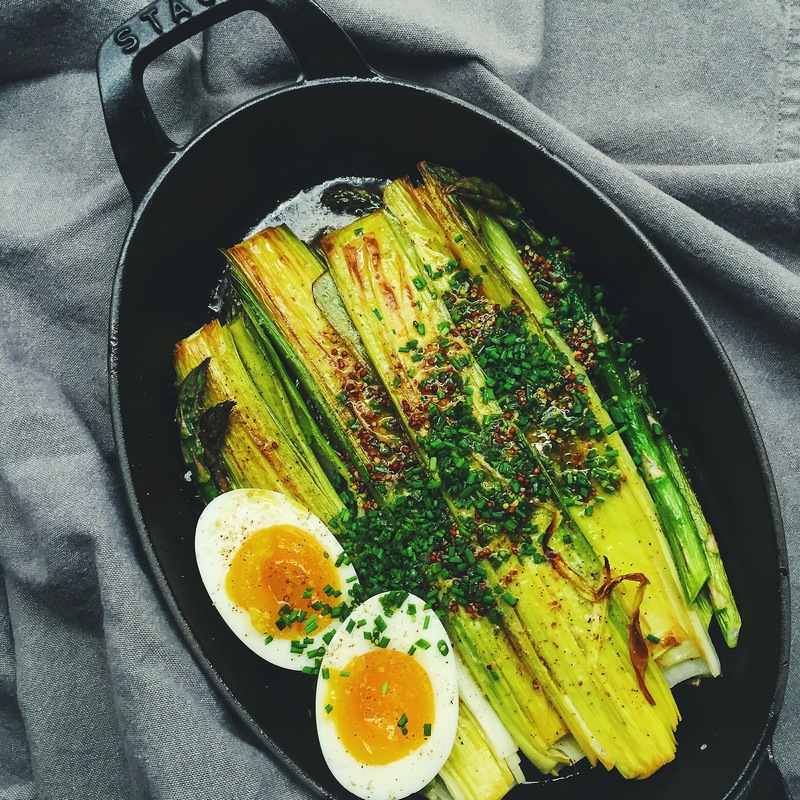 Once butter is melted add the leeks cut side down and cook until leeks are lightly browned. Season well with salt and pepper. Flip the leeks over and pour in the wine. Cook until almost all of the wine has been absorbed. Remove from the heat. Place the leeks on top of the asparagus and pour on any juices from the pan. Top with the remaining 2 tablespoons of butter. Place in the oven and roast for 15-20 minutes until asparagus is cooked but still a little firm. While the leeks and asparagus are roasting, make the vinaigrette. Whisk the remaining 2 tablespoons of olive oil, the vinegar, and the mustard. Season with salt and pepper. When the leeks and asparagus come out of the oven, top with the vinaigrette and chopped chives. Cut eggs in half lengthwise and place on top.